Pinnacle’s excellent ability to provide vinyl installation services has opened the doors for us to meet new clients in the last few months. One of those clients is Cady Studios. Cady Studios is a photography and branding company that specializes in schools. Cady’s services range from shooting school photography to helping to create school culture through collages, banners, and wall graphics. For Cady - No two projects are the same for any school. Pinnacle was approached to help Cady with their branding efforts for Brandywine Elementary School last month. 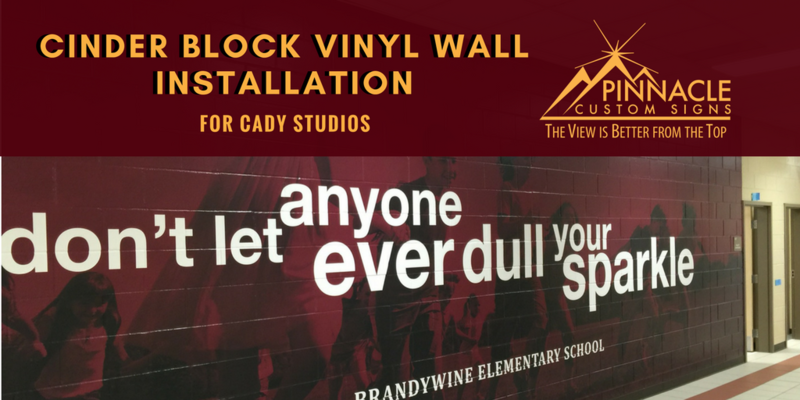 Cady Studios employee Samantha Brisbay reached out to us to see if we had the capability to install vinyl on Cinder Block walls for the school. She was looking for a company that had experience because of the challenges of this type of project due to the ridges in the surface. 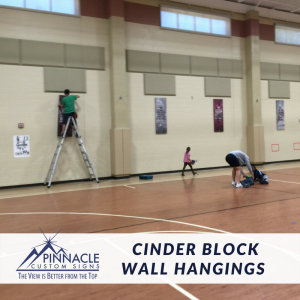 Prior to connecting with Pinnacle, Cady had experienced difficulty in finding an installer who could apply brick wall vinyl with good results. Cady already had the graphics ready for the project, so we utilized the existing material to complete the install for the Brandywine project. The biggest challenge for previous installers was the large cinder block wall graphic that requires utilizing a torch and heat gun during installation. Correctly applying the vinyl so that it contours to the wall indentions created by brick and mortar type walls is difficult but it is possible. 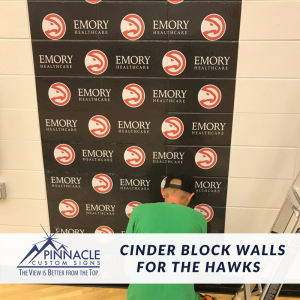 Pinnacle has also recently done similar graphics installations for the Atlanta Hawks Training Facility and will be providing graphics and installation at Duncan Creek Elementary School. Each of these projects has been done by utilizing cast vinyl to print graphics for the type of surfaces. Cast vinyl is thinner vinyl product that is designed to conform to curved surfaces easier. 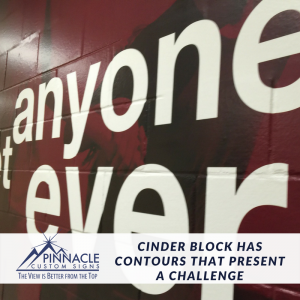 For these particular style projects, Pinnacle uses a specific brand of 3M’s cast vinyl that is specifically designed for textured surfaces such as cinderblock, stucco and brick, when applied with heat. 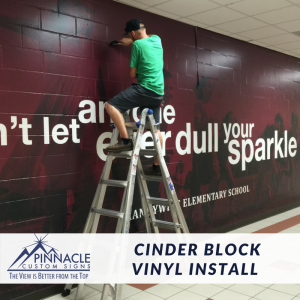 When Pinnacle is asked to specifically do installations and is provided the vinyl graphics we often do not know the specific vinyl material being used for a project. However, there are differences in vinyl. Sometimes we receive cast vinyl for wall projects that is typically used for vehicle wraps. Both of these types of vinyl are design to be applied to areas that have contours and crevices for maximize coverage. The vinyl we were provided to use in the wall graphic installation for the Atlanta Hawks Training facility was more in line with what we typically use for car graphics. The vinyl utilized in the Brandywine project and that we are using at Duncan Creek is a cast vinyl designed more specifically for textured surfaces with 3M’s Envision Gloss Wrap Overlaminate. The similarity in these products is that they are both cast and not calendared vinyl. Calendared vinyl is less expensive and is used primarily on flat surfaces. The basic ingredients are the same for both vinyl products, but the manufacturing process and type of plasticizers used result in significant differences. Cast films are considered the industry premium and are a thin gauge film that is usually 1- to 2-mil thick. This film stays in a more relaxed state, resulting in a durable, flexible, and conformable and film that retains color well. Calendared films are designed for more intermediate or short-term needs. These films are thicker films at 3- to 4-mil that have less dimensionally stable and conformability. This product also tends to shrink when exposed to heat. However, this is a less expensive, somewhat more scratch resistant vinyl product. These films are well suited for flat and simple curved applications on a variety of substrates. Pinnacle is fortunate to have a team that has experience with these types of contours in vinyl installation. Our certified installer has experience with laying vinyl on textured surfaces. The certification process requires that you understand and know how to overcome the challenges associated with textured surfaces to become industry certified. They have typically faced both failure and success in performing these jobs and can tell during the job when either is going to happen. In laying the brick wraps for these projects, our certified team member Trent will typically lay the vinyl first and then heat and roll the vinyl to the contours of the brick wall. However, if the wall is particularly rough, he will heat and roll as his is initially laying the vinyl. Because of the challenges of laying vinyl on textured surfaces, many good installers do not perform as well as expected. Having experience and certification is key in this process. That is why we are able to provide installations successfully in some cases when previous attempts have failed. Cady had almost given up on being able to brand the wall at Brandywine until we were able to ensure those graphics installation. If you have a signage project that you have lost hope in completing, give us a call. We offer free estimates and can conduct on-site surveys to make sure you get the results you imagined with the end results.